Fifty years from now, the sun is dying, and mankind is dying with it. Our last hope: a spaceship and a crew of eight men and women. They carry a device which will breathe new life into the star. But deep into their voyage, out of radio contact with Earth, their mission is starting to unravel. There is an accident, a fatal mistake, and a distress beacon from a spaceship that disappeared seven years earlier. Soon the crew is fighting not only for their lives, but their sanity. Man's last hope lies with a heroic group of eight astronauts and scientists aboard the spaceship Icarus II charged with delivering a stellar fission bomb into the heart of the sun. Download Sunshine in Digital HD from the iTunes store. Sunshine images are © Fox Searchlight Pictures. All Rights Reserved. 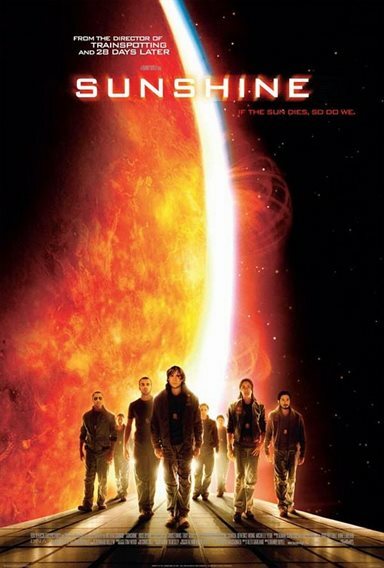 Sunshine is a British science fiction film showing the sun is starting to die. A team of astronauts is sent with a massive bomb to try to reignite it. For a movie that focuses its energy on being smart, this sounds pretty dumb. How can any terrestrial bomb reignite a star? The answer is, "it can't", and the team knew it; they have an explanation even if it isn't very tight. The film itself is patterned after 2001 or 2010, Silent Running, and, possibly even Alien. I'm going to assume that we are a bit past the spoiler date -- Sunshine came out in 2007 -- so I can talk a little about how the movie works without the fear of giving something away. The basic issue with Sunshine is the problem that Chris Carter had with his X-Files TV show before he realized he had a hit and no actual back story. In the original conception, Carter and the crew intended to have shows with the paranormal, interspersed with hoaxes of things that would appear to be supernatural, but actually be legitimate; it was a chance for Scully to be right some of the time. They discovered the problem was that those scripts were boring. Sunshine wants to be hard, science fiction, and while we can debate whether reigniting a star with a bomb the size of Manhattan is realistic, I want to point out that traditional hard, sci-fi allowed a few things that were beyond the scope of modern comprehension -- so long as the science behind those was at least considered. Given its limitations (no aliens, no space opera), it has to build tension in some legitimate way. Its choice is to have the crew discover a distress call from the previous solar-restart mission that was presumed lost. There is a chance that the other crew might be alive, and the current ship could divert and maybe pick them up. At this early in the film point, I was concerned that one of the characters might make a passionate plea to the crew's humanity and try to see if there were survivors to rescue. With he future of earth hanging on the line, the idea that the ship would stop to save someone -- anyone -- was ridiculous. Fortunately, they didn't; the writers came up with a perfectly plausible and very believable reason to re-route to the other ship. I was reasonably impressed. Unfortunately, it all slowly goes down hill from there. In order to inject excitement, the plot has to do some things that appear uncomfortably like gymnastics. The surprise is presented with a special effect that I do not believe even the characters in the movie see; I think it is for the audience, and I didn't buy it. It is also slow. Movies that try to give us realistic, majestic, space travel have long slow shots of the huge ships plowing slowly through space. They give us tension in EVA space-walks under dangerous conditions. They tell us dire stories of what will happen if the antenna is down or the O2 is depleted. This all takes time and unfolds, like the traditional zero-gee shot, in slow motion. You do not really move in slow-mo in zero gee, but the movie stuck with it because they felt people would expect it. You can possibly get away with this if you are Stanley Kubrik. When you get to the last quarter of the movie, if you are not, you need something a bit more energetic and immediate. Unfortunately, what Sunshine comes up with manages to be a bit dreary and drawn out. My immediate thought was a simple counting exercise in one of the scenes that would have cleared up a lot, but this crew of geniuses didn't think of it. What we get in the end, is a movie that spends too long winding up and then winds down at a faster -- but still unsatisfying pace. Sunshine isn't a disaster, but the only reason I watched it to the end was because I was curious about whether it had any real surprises up its sleeve. It didn't. This movie should've been bigger then it was!